If I post a plain old ordinary "mushroom pizza" now, what if I wanted to post a different mushroom pizza in the future? What would I call the second one? I find it easier just to be exceedingly descriptive. And Drunken Mushroom Pizza is exceedingly descriptive. I made this pizza shortly before my spouse deployed, and I chose the topping for 2 reasons: first, I knew I'd be the only mushroom eater in the house for a long stretch, and second, because I knew he'd not be drinking wine for a long stretch. My goal was to duplicate my Skillet Mushroom Dip for Two on a pizza crust. I poured the wine in my German wineglass (love the wine festivals, and love the German efficiency of having the measuring line so the server knows how much to fill the glass) thinking that I'd add a splash to the skillet and then drink the rest. But I forgot and dumped the entire thing into the pan. Whoops! 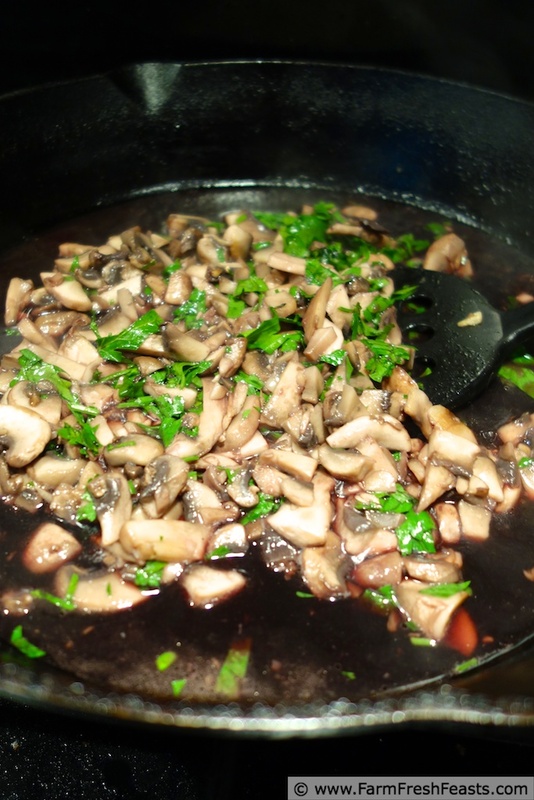 Change of plan, we'll just make a red wine reduction and get those 'shrooms drunk. We enjoyed this pizza our last Friday night together, and I hope you enjoy it with someone you love (who also loves mushrooms). Right after I realized 'oopsie'--that's a lot of wine. Can you see how the mushrooms are dyed red from the wine? Preheat oven to 450 degrees Fahrenheit, and if you have a pizza stone, please preheat it as well. On an oiled piece of parchment, stretch out the dough in a shape that pleases your loved ones (some of us like corners). Set aside while you work on the mushrooms. Preheat a large skillet (cast iron for me) over medium heat, and add a turn of olive oil. 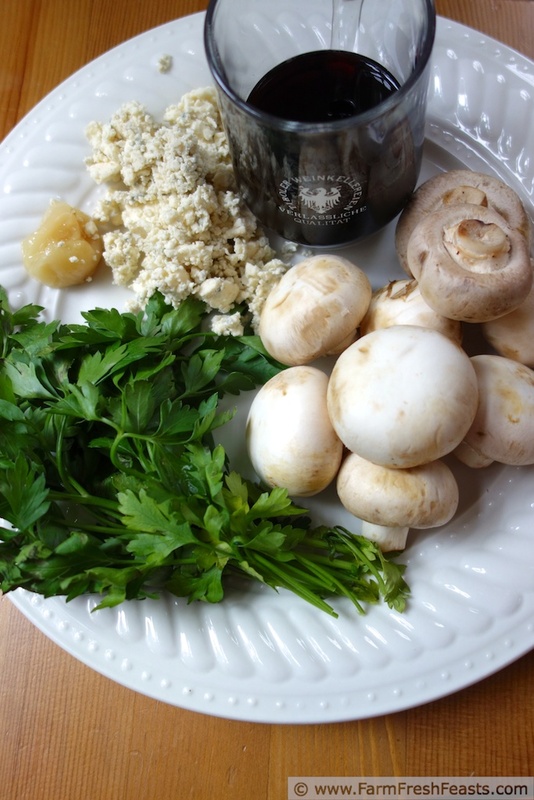 Sauté 5-10 the mushrooms for 5-10 minutes until they give up their liquid, then add the parsley and roasted garlic. Stir together and sauté for another 3 minutes. Pour the wine over everything and let it reduce down until barely any liquid remains and mushrooms are glazed/dyed/dark red from wine. This took me another 8-10 minutes, but I was right there watching. Remove from heat, and sprinkle a pinch of salt and a few grinds of pepper across the mushrooms. Lightly brush crust with olive oil (roasted garlic olive oil would be amazing here), and top evenly with mushroom mixture. 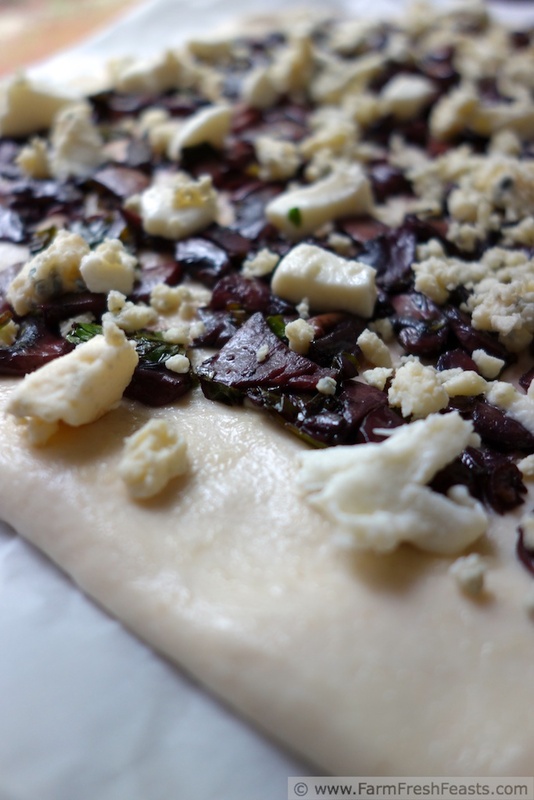 Scatter gorgonzola across pizza, then add bits of fresh mozzarella in the open areas. 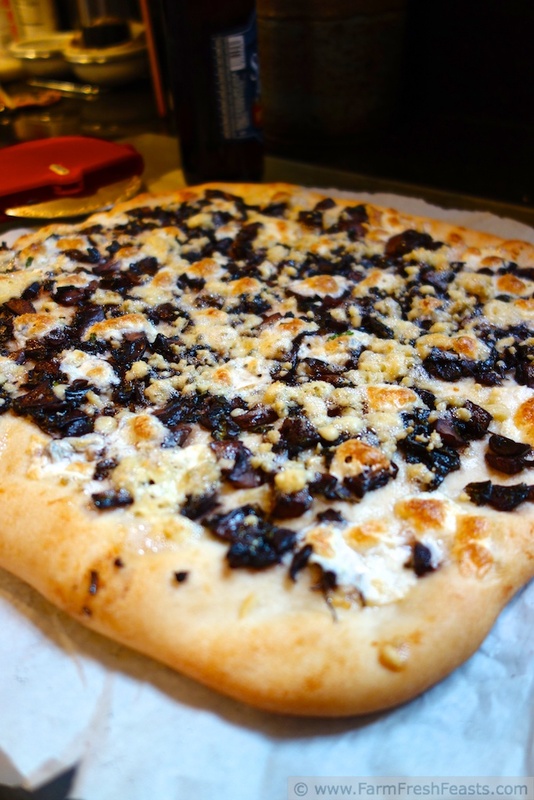 Bake on parchment paper in a preheated 450 degree oven for 5-8 minutes, then shake the pizza off the parchment and continue baking on a stone, or cookie sheet, another 3-5 minutes until mozzarella is browned and gorgonzola gets all bubbled. Cool on a rack for a few minutes, then slice and serve. Toast your honey with some more wine. This pizza is shared at the From The Farm Blog Hop, the Clever Chicks Blog Hop, Tasty Tuesdays, the Wednesday Fresh Foods Link Up, and What's In The Box at In Her Chucks. Awww...that is so romantic. Your posts totally make me feel like I'm there with you listening to your stories. And I'd rather be telling them to you at o dark thirty while we are getting exercise, since I really do not have that motivation when it's just Simon and I for a morning walk. Sauteed onions (or shallots, since I just harvested a bunch of them) would be delightful. Is it an engineer thing that you and the spouse both prefer the squares? Mm, there is nothing better than pizza on Friday nights. Thanks for sharing, I love mushrooms on pizza! I could probably be happy with chips, guacamole, and beer on Friday nights, but the people I share my household with are . . . conditioned? trained? expecting? demanding? let's say they are used to their Friday night pizzas, so there we are. Kirsten, this looks fantastic! I love when a cooking whoopsie turns into a great recipe. Thanks! You've come to the right place for cooking whoopsies, then! I think my ice heart just melted a little. That's sweet and delicious and should I say it...intoxicating. Love it. I want to move next door to you, so that I can share your pizzas every Friday. 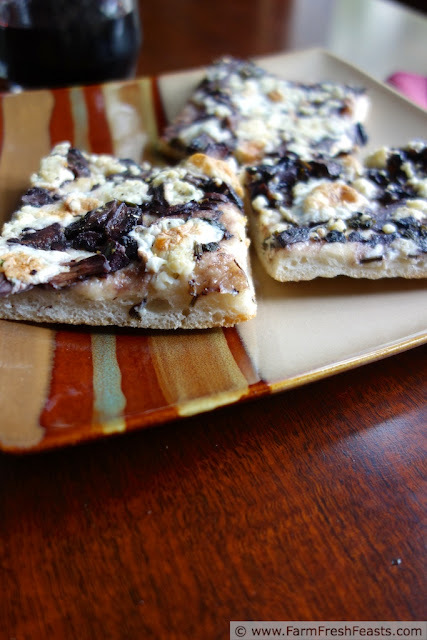 I adore mushrooms and can't wait to try this week's pizza gem! I would be delighted to have you over for pizza and libations! I think the best part of being your neighbor would be the ability to pop over and borrow just a teaspoon of something from your pantry, so I could try out new things. Gorgeous with the deep red mushrooms! And beautiful story of love – nothing says, "I love you," more than cooking for your spouse's tastes. A true labor of love. Perfect! Now I'm 'putting up for love', as I think my spouse would love the various garlic scape pestos I've been making, so there's a freezer stash just waiting for his return. The mushrooms really are red from the wine! Great job. I tend to be a wine fan. Thanks, Tammy! I vary, and am currently on a blueberry-lime margarita kick. Someone has to clean out all of last year's berries from the freezer you know. I'm glad you came up with a name--the naming part is hard for me. You're right! There is never too much wine, so I wasn't too concerned when I dumped the whole thing in. Haha that's something I've done. Just the other day I was supposed to add 1/4 cup of heavy cream and save the other 1/4 cup. Well guess who dumped 1/2 cup in all at once? Ahh well sounds like you still rescued this pizza! Mushroom pizza is one of my favorites to order. 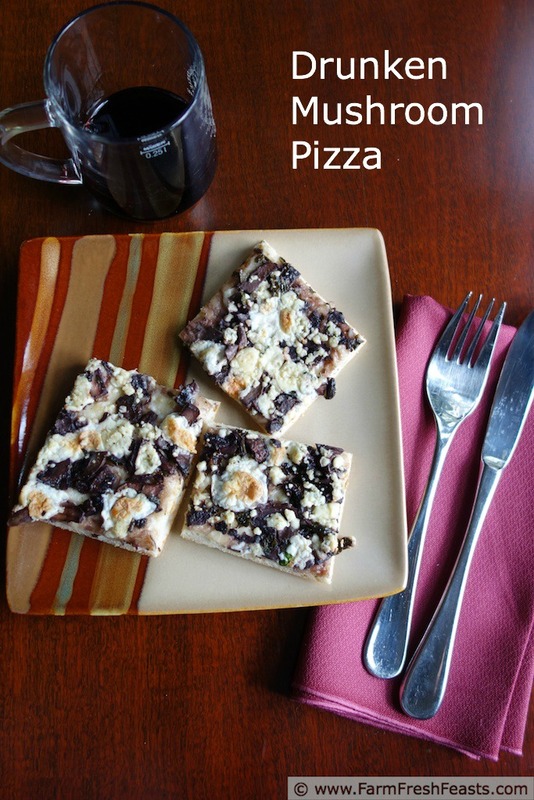 Next time I have red wine leftover (and yes, with just me there is leftover wine), I'll try this pizza! So you could double the recipe for something delicious if you doubled the cream? I say it in My Deployment Pizza, but I prefer wine in a box when I'm the only adult at home as it keeps as long as I need it to. Please let me know how the pizza works for you! OH EM GEE. I love this pizza. I do, too. Of course, I'm a fan of all pizzas. Drunken mushrooms are my kind of thing! :) I would devour this pizza! Thank you so much for linking up with me this week at Tasty Tuesdays! I’ve pinned this & shared it with my followers! Please be sure to stop back by the party and check out some of the other links! Thanks so much for hosting a terrifically tasty Tuesday! I used to be that way with olives! Too funny.